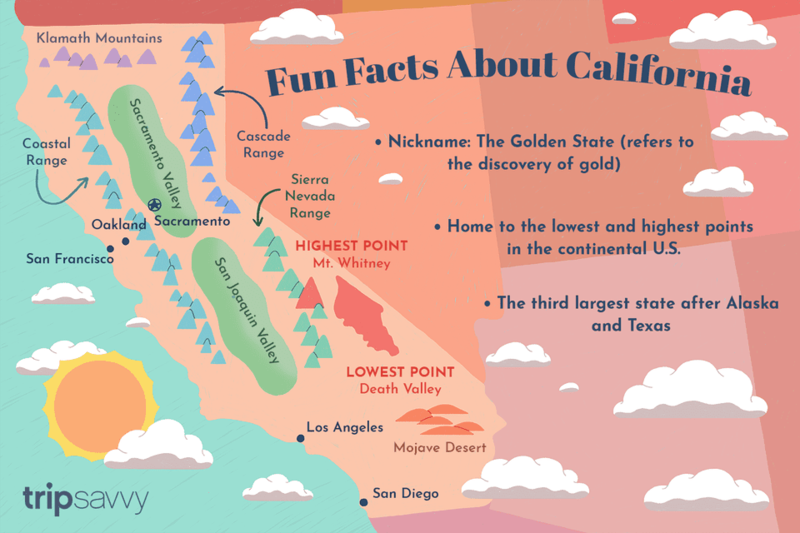 California contains the lowest and the highest points in the continental U. S. You can travel from 282 feet below sea level in Death Valley to 14,494-foot Mt. Whitney in less than a day. California is home to the world's largest tree (General Sherman Tree in Sequoia National Park)6 and the tallest (a coastal redwood whose identity is withheld)7. Two actors have become California governors: Ronald Reagan and Arnold Schwarzenegger. Reagan is the only California governor to ever become United States President. You'll find some of the most common California state symbols on the following pages, including the flag, seal, flower, animal, bird, tree and fish. The rest are listed below. Tartan: Based on the Muir Clan tartan in meadow green, pacific blue, charcoal, gold, redwood stripes and sky blue. You have to wonder how the legislature gets anything done with all the time it must have taken to approve all these California state symbols. The California state flag has its origins in early California history. On June 14, 1846, while California was still under Mexican rule, a group of settlers in Sonoma proclaimed California to be an independent republic. They hastily created a California flag that showed a grizzly bear and a five-pointed star above a red bar. It said "California Republic." The first California flag flew for less than a month. The United States had declared war against Mexico on May 11, 1846, but information traveled slowly back then and it took until July 9 for the news to reach the instigators of what came to be known as the Bear Flag Revolt. In 1911, the state of California adopted the Bear Flag as the official California flag. The California state seal was created when the state was first formed in 1849. The idea came from Caleb Lyon, a clerk of the California Constitutional Convention, but the design of the California state seal was done by Major R. S. Garnett of the United States Army. The botanical name of the California state flower is Eschsholtzia californica, given to the pretty yellow/orange flower by naturalist Adelbert Von Chamisso a Prussian scientist who visited San Francisco in 1816. It became the state flower in 1903. It's commonly called the California poppy or golden poppy, but other names for the California state flower include flame flower, la amapola, and copa de oro (cup of gold). The California state flower is so popular that it has its own day: April 6. You'll see the California state flower blooming all over the place - and maybe even in your own flower garden. The best place to view them in nature is at Antelope Valley Poppy Preserve near Los Angeles. The California quail (Lophortyx californica) could easily be the cutest California state symbol, with its bobbing top-knot and black bib. It's a hardy and adaptable creature, found in flocks of up to 60 except during spring nesting season, when they break up into pairs. They're most common in chaparral and low grassy areas and they range along the Pacific coast from Mexico into southern British Columbia. It seems the California state bird may have failed to get the message about its status - some say its call sounds like "Chi-ca-go." "California redwood" has been the official California state tree since 1937. It's not a very specific name because there are two kinds: coastal redwoods or sequoia sempervirens (sempervirens means evergreen) and giant sequoias or sequoiadendron giganteum. They're a good choice for the California state tree(s) because they only grow on the Pacific coast and mostly in California. Coastal redwoods grow tall - almost 400 feet - and giant sequoias are massive. General Sherman Tree in Sequoia & Kings Canyon National Park is more than 274 feet high and over 102 feet around its base. Find out where to see the California state tree and learn more about California's redwood forests. Not only is the giant sequoia the California state tree, but General Grant Tree in Sequoia National Park is one of several trees that are called our Nation's Christmas tree. The specimen of the California state tree shown in the picture is from Sequoia National Park. The golden trout (Salmo agua-bonita) is found only California, mostly in mountain streams. Once found only in the Kern River's headwaters, the golden trout can now be found in other locations in the Sierra Nevadas, having been raised in hatcheries and stocked into other streams. It has been the California state fish since 1947. The largest golden trout ever caught weighted 11 pounds according to the International Game Fish Association, but most of the ones we've seen in pictures are much smaller than that. Before you go fishing for one, the most obvious place isn't the best one to go looking for the California state fish - they're protected in the Golden Trout Wilderness. If you'd rather help them survive then catch them, the Golden Trout Project organizes restoration and monitoring activities to help preserve their habitat. There are actually two California state fish. While the Golden Trout is called the California State Fish, the Garibaldi is the State Marine Fish. You figure. Issued as part of the United States Mint's 50 State Quarters® Program, the California State Quarter first appeared in 2005, the 31st state quarter to be released (in honor of California being the 31st state). It was designed by Alfred Maletsky. The California state quarter was chosen from among several finalists. Governor Arnold Schwarzenegger chose the final California Quarter design and the U.S. Department of Treasury approved the "John Muir/Yosemite Valley" California state quarter design on April 15, 2004. The official California state animal is actually extinct. A bear appeared on the first California flag, but the California grizzly bear (Ursus californicus) didn't become the official California state animal until 1953. These large, powerful carnivores were once common in California, but early settlers couldn't find a way to coexist with them and by 1922, the last California grizzly was killed in Tulare County. The picture above was taken is Grizzly Peak at the Disney California Adventure theme park. According to their website, the idea for it comes from "an ancient legend, the peak was once a giant bear named Oo-soo'-ma-te, whom A-ha-le the Coyote transformed into stone to watch over and protect the land." At 14,494 feet, Mount Whitney is the highest point in not only California but all of the contiguous United States. Geographically, it's in Sequoia National Park, but it can't be reached (or seen) from the main part of the park. However, it's easy to spot as you travel along US Hwy 395 east of the Sierras near the town of Lone Pine. Climbing Mount Whitney is a 22-mile (35 km) round trip, gaining over 6,100 feet (1,900 m). This hike is definitely for those who are fit enough to handle it. Find out more from GORP.com. At the other extreme, in case you got here from a search engine and didn't see it, Badwater over in Death Valley is at 282 feet below sea level, making it the lowest point in not just California but all of North America - and it's only 84.5 miles (136.0 km) away (as the proverbial crow flies). According to the sign, it's 282 feet below sea level and it's the lowest point in not just California but all of North America. Every July, the extreme Badwater Ultra Marathon starts from here, with runners taking over 30 hours to cover 135 miles (217 km) to reach the Whitney Portal on the side of Mount Whitney, at elevation 8,360 ft (2,550 m). Up to 90 of the world's toughest athletes start their run in temperatures up to 130°F (55°C). It's easy to understand why it's often called "the world's toughest foot race." And speaking of extremes, Mount Whitney (which is in the previous photo), the highest point in the contiguous United States, is only 84.5 miles (136.0 km) away (as the proverbial crow flies).